DWG was contracted, by Roper Hospital, as the mechanical, electrical, plumbing, fire protection and communications engineering firm. LS3P Associates, ADC Engineering Specialists, FEC, and NBM Construction were selected to provide the Architectural, Structural, Helipad, and Construction services, respectfully. Through effective communication and collaboration with the Board of Architectural Review and the Authorities Having Jurisdiction, the team was able to successfully design and construct a roof mounted Helipad on the South Tower of Roper Hospital, a landlocked facility, in Charleston, SC. Prior to the construction of the Helipad, Roper Hospital had to rely on transferring air-lifted patients from the adjacent Helipad to the hospital via ambulance. 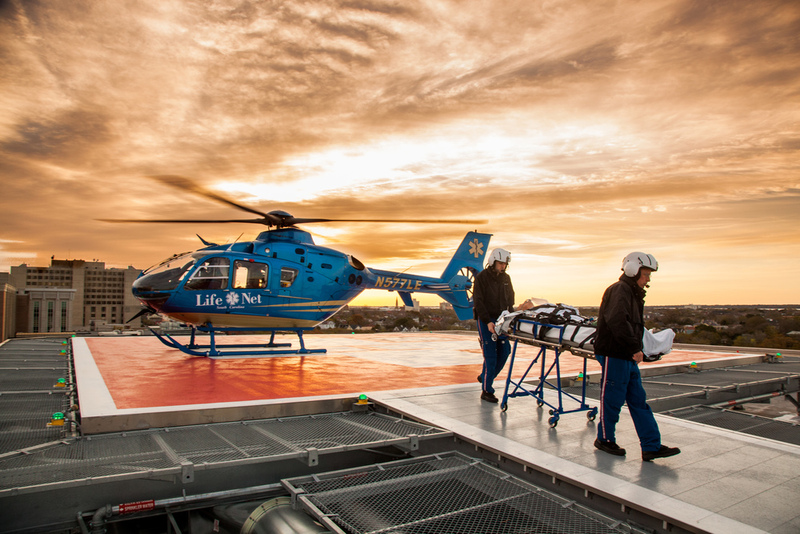 Now, helicopters can land directly at Roper Hospital, allowing patients’ uninterrupted access to and from hospital. This project could not be accomplished without a team of engineers, contractors, architects and owners with cooperative, “can do” attitude and a strong sense of purpose that the work must be completed within a specific time frame. DWG provided 24/7 on call engineering to be at the site as needed to investigate and answer contractor questions during demolition and construction. While this project was extremely challenging due to the complex nature of the systems and the vast number of components involved in the renovation, obstacles were overcome through careful planning, systematic implementation, and a concise phasing by all team members.